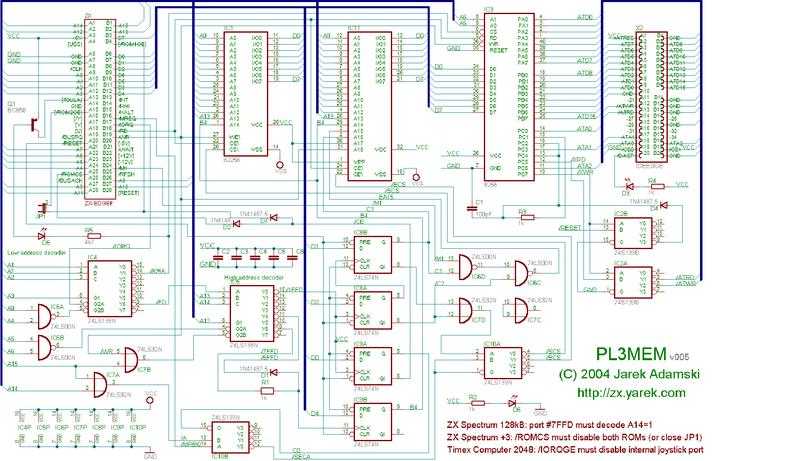 PL3MEM is extra memory and IDE interface for ZX Spectrum. The memory is 32kB RAM and 64kB or 128kB EPROM. The switching is compatibile to ZX Spectrum +3 (#1FFD and #7FFD ports). 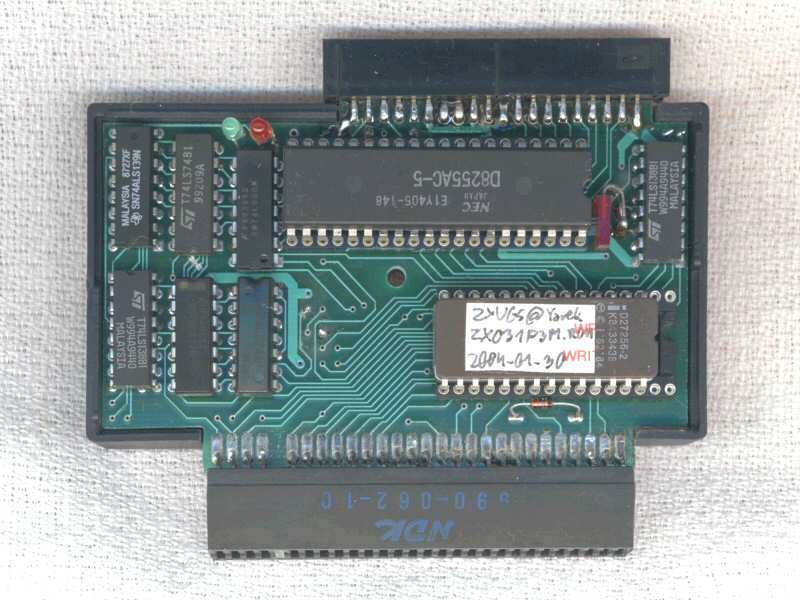 32kB RAM and 64kB ROM are used by ZXVGS P3M. The other 64kB EPROM can be used as romdisk or +3e can be installed. The IDE interface is build-in YAMOD.IDE8255 (see below). ZXVGS P3M uses IDEDOS partitions on the hard disk. The proper structure can be made with QDISK program. Also, the harddisk structure and contents can be created with QTRANS.EXE on PC. 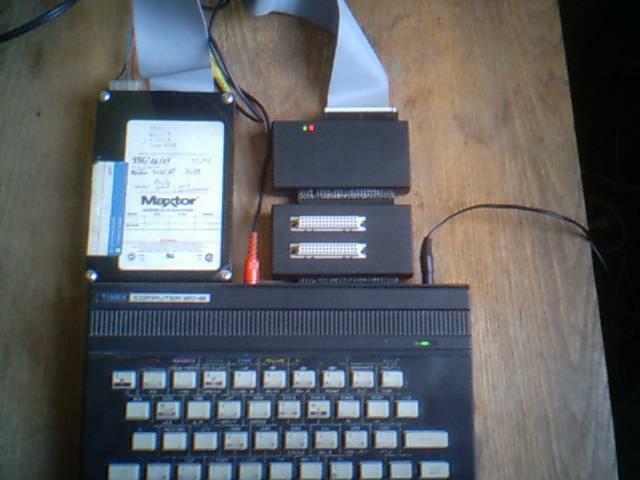 Except hard disk, ZXVGS can boot from floppy of ZX Spectrum +3 or compatibile. As PL3MEM simulates the ZX Spectrum +3 ROMs, requires the connected computer to be insesitive to #1FFD (8189) port address. Please try OUT 8189,3 and if the computer resets, PL3MEM will not correctly with it. ZX Spectrum 48K - no problems. ZX Spectrum 128K and +2 - port #1FFD works like #7FFD and PL3MEM will not work without upgrade (adding A14 to the internal #7FFD port decoder). ZX Spectrum +3 - not tested, no problems are expected. PL3MEM requires the PL3FIX edge slot correction or must be prepared as +3 dedicated. Timex Computers 2048 - there's port conflict between YAMOD.IDE8255 and internal Kempston Joystick interface at addresses #1B (27) and #5B (91). The /IORQGE line at edge slot must be corrected internally to allow PL3MEM disable the joystick reading at these addresses. Timex Computer 2068 - no problems. In place of EPROM it is possible to install small board with 512kB PEROM (29C040) and some logic. This gives 32 pages of 16kB each that can be reprogrammed at any time. 4 pages are reserved for +3e, another 4 for ZXVGS. Other 24 pages can be used as 384kB PEROM-disk. The disk can contain boot files of ZXVGS P3M and CPM22QED P3M, also some utilities. When +3e is not used, the PEROM-disk can have 448kB. Timex Computer 2048, YABUS.ZX, PL3MEM and Maxtror 7120AT (124MB) connected together. Some technical notes to the project. Eagle schematics v005 in picture. Manages Disk Objects - disk drives, diskimages, files on them, partiton tables, etc. Creates, removes, copies, renames anything you want. ZXVGS for PL3MEM interface and ZX Spectrum +3 upgrade. Supports floppy disk and IDE interface.